Document: who’s responsible for what in health? 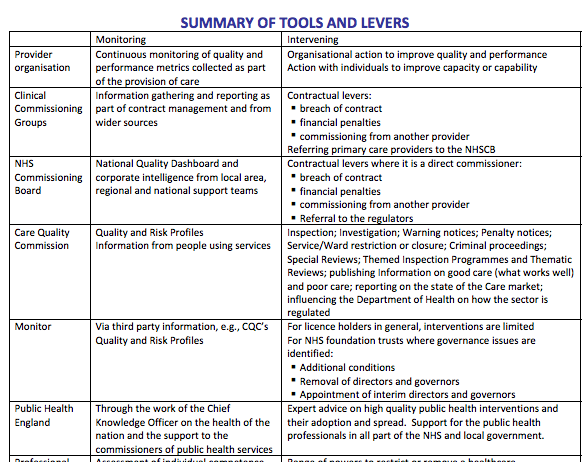 If you want to get an overview of the different parties involved in the new health system and their roles – including some new players as well as old players with new responsibilities – a recent report from the National Quality Board‘s (NQB) is worth a look. Seventeen NHS hospitals have dangerously low numbers of nurses – Telegraph – The hospitals, many of them busy district generals, were issued with warnings by the Care Quality Commission after its latest inspections, the body has disclosed. Each was told it did not have enough staff “to keep people safe and meet their health and welfare needs” — the standard every part of the health service must meet.